Putting The Farm Up For Sale - A Life Changing Decision! Yes, our little Old World Garden mini-farm is really for sale! I’m sure that may absolutely stun and shock a few of our followers this morning. But it is indeed true. And it is not a sad time for us at all. First off – It is not the end of our blog. Nor the end of our OWG story. In fact, it is only making way for a new adventure and story to come. We aptly name it : Old World Garden, Version 2.0. We will continue to do the things we love. That means continuing to write every week about Gardening, DIY and the Food and Recipes we love. And more than ever, we will continue to speak about those topics whenever and wherever we have the opportunity. It is what we truly love to do, and hopefully can do so for the rest of our lives. But we also love to take on new challenges. Life to us is about working hard, playing hard, having fun, embracing change, and living every day to the fullest. No regrets, no looking back. Ever. In January, I was asked by my company to take on a new position in Tennessee. It gave us the opportunity to think about what was next for us. What was our next challenge? Anyone that knows us knows that “Jim and Mary” have always been and will always be “dreamers, leapers, and love to doers.” It is who we are, what we love, and how we live. There are two words that have always driven our life together and our adventures – and they are simply : “Why Not?” And when the challenge of creating something new, in a warmer climate presented itself, we simply said, Why Not?! We have never been ones to be tied to possessions. We never want to be, it is truly part of living simple. We are, to use an appropriate gardening term, two peas in a pod. One thing is for sure, we love the process of building and creating new projects and adventures as much or even more as enjoying them once completed. It is in the “doing” that we find true happiness and are at our best. There are two things that remain on “life’s major bucket list” for us. One is to build an even smaller homestead in a warm climate to enjoy outdoor living even more. The other, at total retirement, is to take a 52 week tour in a small camper around the entire United States to see the country up close. Moreover, the people, gardens and sights that our followers have in their own backyards. Someday, we will mark a check in the box for both bucket list items. For now, it is time to tackle #1 on the list. And we have hundreds of ideas floating through our heads for our next project. Everything is on the table. From creating a tiny “Urban Home and Farm” on a small city lot, to rehabbing an old downtown loft building into a rooftop garden and home. Who knows, perhaps even building a small homestead on a little tiny plot of land in a secluded rural area. The options are endless, and I have to say we are incredibly excited about a new challenge and our future. Whatever we decide, we will have a blast doing it. We will also greatly enjoy writing and telling the story. All along of course, making sure to find a way to still grow our food, raise a few chickens, keep bees, and cook up some delicious food. We are not sad. Nor upset. We are truly proud of what we created, and excited and ready for what is next. There is not a single regret other than knowing we will miss a lot of incredible neighbors, friends and family with our move south. We look forward to an amazing new chapter and challenge in our life, and to making even more memories. You only get one shot at this life and world – why not live it like crazy! In the past, we have been approached often by those asking if we would sell. To be fair to all, we want the farm sale to be as simple and open as possible for us and all potential buyer(s). We want to find someone who will love it as much as we did and enjoy it to the fullest. In fact, feel free to share this article with anyone who might fir the bill!!! To keep it fair, we will take open bids for anyone interested in purchasing the property from now until July 15th, 2018. Bids can be emailed to us at thefarm@owgarden.com. We do ask that each bid include a pre-approved letter from a mortgage lender. For those that are interested in purchasing the farm, we will host an open house on Sunday, July 1st from 1-4 pm to look at the house and property. As we go along, we will determine whether we can accept any bids at any point in the process, or need to list the property with a local realtor. 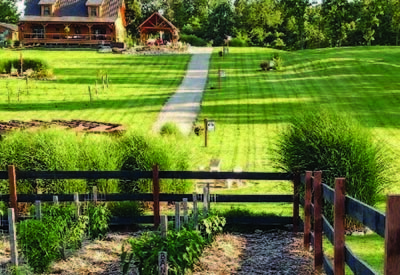 The mini farm sits on approximately 2.5 acres of land in rural eastern Licking County, Ohio. It includes 44′ x 24′ main house, 32′ x 24′ detached garage which includes a small efficiency space for a separate bedroom / office space. It has a full bathroom with shower. 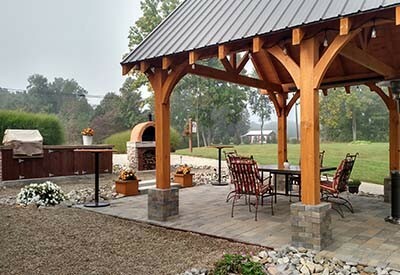 The property also includes a 20′ x 16′ outdoor pavilion, 2 outdoor kitchens, pizza oven, 32 x 24′ concrete floored barn with two attached 12′ x 24′ concrete-floored covered porches. 10 x 10 concrete pad and hot tub, 12 x 8′ garden shed, 6′ foot outdoor fire pit, pergola, 12 x 8 chicken coop with covered awning, and multiple outdoor seating areas. Also included is a 40 x 60′ fenced raised row garden area, strawberry patch, blueberry bushes, mini orchard and vineyard area. The property has many gravelled pathways that lead to the various structures and sitting areas. 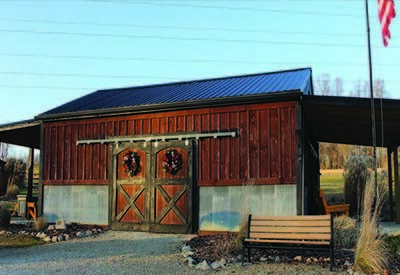 The main driveway is paved with durable and long-lasting chip and tar the entire way down to the main barn. There are multiple landscaping beds around the farm and over 600+ perennial plants, shrubs and bushes. The landscaping includes 2 separate low voltage lighting systems, along with multiple outdoor plugs for outdoor electrical needs. You can find additional information here : Selling The Farm – The Farm In Detail. Happy Gardening, Happy Living, and most importantly of all, here is to a bright future! Jim and Mary. ← Spring Photos From The Farm And Garden – The Farm Comes Alive! Hi Betty Thank you so much for following our journey. We hope this next phase will be just as exciting and informative! We will be moving to middle TN, just outside of the Nashville area. We travel to NC often so maybe one day soon our paths will cross! Thanks for all of your support! I have thoroughly enjoyed your blog for a few years now,also your recipes and gardening tips which I have used very successfully. I have watched as you have built up the farm and I thought you had one of the most beautiful gardens I have ever seen. I love the country life . What part of Tn. will you be living in. My brother has lived in Tn.many many yers. I am in N.C. I feel like we are family and I wish you all the best. Tennessee is beautiful country, I am sure you will love it. Hubby and I used to talk about retiring to the Elizabethton area but we probably won’t move away from our children. Good luck in all you do going forward. Thank you so much for following our website. We hope that you will continue to find the information useful and also exciting as we begin our newest adventure. Best wishes to you as you embark on an exciting new adventure! 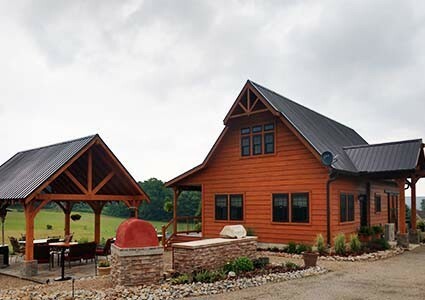 I am sure you will have no trouble selling your beautiful property and finding something nice in Tennessee. I enjoy the blog and have used some of your gardening tips with great success. Hope to keep reading as you keep writing! Thank you Kat! We have enjoyed everything we built in Ohio and can’t wait to see what we can conjure up in TN! Thank you Eilleen – you know what we will be going through and we are open for any advice! Thank you for following our website over the years and now! Yes it was both a huge decision that took many hours of pondering. And yes, we are both blessed to be two peas in a pod who can take this (and every) journey on together! That made us both laugh! Thank you for being a faithful follower and I hope that you enjoy our newest adventure just as much as you have watched the first one unfold! Thank you so much! I hope they enjoy the space as much as we have! Thank you Kathleen! We appreciate you following our journey now and in the future! Thank you so much! We can’t wait to see what TN will be like and most of all, we can’t wait to eventually see all 50 states to determine where the Final OWG will be! Thank you so much for following along in the past and now! Thank you Jean – We are excited to continue the blog and keep everyone updated on where our journey takes us! We can’t wait to travel the country and meet wonderful people like you! I enjoy your site and articles in part because we live two counties east of you, and have done many similar projects on our 5 acre homestead. TN is nice too, great climate. I look forward to reading your future endeavors there. Shocking news, at first, but totally understandable. God bless you in all the decisions you have to make. I’ve been following you for years, and am excited to see how you take on the challenges. We moved to Missouri years ago, and had to re-learn how to garden. Here’s to the adventure! I so happy that your journey continues. I hope the next chapter of your adventure is all that you dream it to be. The home you created is beautiful and I wish I could purchase it! Praying that all goes well for you and that the perfect family is chosen to live in this little slice of heaven. I’m indeed shocked but know that you’ve done your research and felt this was best for this time in your life. I’ve followed your journey and enjoyed your blog. May you have peace and blessings as you move forward in your life. Good luck in your move! I’ve really enjoyed watching your mini-farm grow. I don’t know, but having lived in the South and Ohio, I prefer Ohio better. Four seasons are nice. 😉 Once again, have a safe journey to your new home. Wow!!! Happy for you both. I read your blog post to my husband as we drove to church this morning. He said, “Good, we can go to their farm to table event in Tennessee” ( we were there last September). Cant wait to follow along on this next chapter in your lives. Godspeed in selling the farm and moving. Hugs and prayers for safe journey and transition. Thank you Barbette! We have to agree that a healthy life is one where you do what you love and follow your dreams. Thank you for following our website and we hope that you will continue to find some content useful! Thank you so much! We are so happy that you could find something useful on our website, and we hope that our journey is one that you will continue to follow! Thank you Mary! It sounds like we are going to be neighbors, as we will be living in middle TN as well! Hopefully our paths cross on our newest journey! Thank you Beverly – we hope you will continue to follow us! Thank you Anne! Life is always a journey and we enjoy each adventure that it throws our way! Thank you for following our website! Thank you Ron — we are excited as well! Thank you Ann! We will continue to share our stories, gardening advice, and more through our website. We appreciate you following along in our journey! We will be honored if you would continue to follow us on our newest journey! Thanks for your support! We are definitely excited for the move to TN! We have visited most of the major cities and Jim’s job will land us near middle TN so we can begin the next OWG adventure. Thank you for following our website, and who knows, maybe we can meet you at one of our gardening talks someday! We couldn’t have said it better Paula! Every opportunity leads to learning and experiencing life to the fullest! We are happy that you will continue to fall our journey! Thank you for such the kind words and inspiration Patricia! We are most excited to extend the growing season in the south, and of course, eat wonderful Southern cooking! Thank you so much! We are so excited to make the move south and see where we can get our hands dirty! We will also be close to Nashville for Jim’s work. As ironic as it is, my parents live in FL as well – Ft. Myers area. Thank you for following along and we can’t wait to share our newest stories with you! What wonderful things that you are doing with the community garden! Thank you for following along our journey and implementing tips to help others! Life is not only an adventure but meant to give back! Tennessee is a beautiful area with much to offer. We can’t wait to start our next OWG journey there and learn more gardening tips and techniques to share with our readers! So you guys know what we are going through! Life is about change, and making the best of each journey. Thank you for the advice and support! Best of luck to you both! Hi Steven. We have considered the best option based on our family and career moves. At this time, we have decided that it is best for us to sell the property to continue our Old World Garden websites and speaking engagements around the country. I bet you could find a farmer around your area that would appreciate the help in turn for teaching you the ropes! I am so glad you are going to continue the blog! I would really miss my weekly sojourn on the “farm”. It’s strange how people can have the same bucket lists, though we’ve never met. We would also love to head south and be able to travel the entire country. I’ll look forward to enjoying each new phase of your journey. May God bless you both in all you do. I am so happy for you both! A healthy life is when we follow our dreams and move on to the next adventure. Very happy to hear that you will continue the blog; I go to your web site first, for all gardening questions, and am always learning from you. Gods Blessings on your new journey! I’ve followed your blog for many years. You’ve been my go to source for all things to turn my country house into a working homestead. Thanks to you, we now have a mature orchard, a full garden, a stocked canning cupboard, chickens and fresh eggs, and even the Chinese Five color peppers in hanging baskets. I have loved every minute spent reading about your journey and have been greatly enriched by all that you’ve taken time to write about and share with all of us! Wow….was not expecting this news. Another chapter in your lives. I wish you good luck with the selling and the moving. I’m sure you will love Tennessee as much as my husband and I do. We moved down here in 2011 from WI. We enjoy the people, the warmer climate and the magnificent views along with the lower cost of living. We live in mid-Tennessee about 15 minutes from a small town and 45 minutes from a larger town. We do like the country living here. We will keep up with your news through your blogs and follow your new adventures along with you. We welcome you to TN and God Bless you both on this new chapter. Good luck in the next chapter of your life. I look forward to your blogs in that new life! Stunned!!! was my first reaction…I completely understand the moving on part, though. I agree, the fun is in the doing. Can’t wait to meet in person if you camper through my neck of the wood’s (Draper, Utah)…I will continue to follow you as I love your tips. Good luck with all of your universal surprises!! Best wishes for your future endeavors. I’ve enjoyed your posts for some years now.Happy trails. I have been following the two of you for the past year and also like your lifestyle. I know things are thrown in your path that changed your direction. Hope your journey will take you wherever it goes. Your approach to life and possessions is admirable! Please continue to share life with us as I learn from you! Please allow us to “ride in the backseat” of your journey. God speed and best to you. WOW!!! What a shocker for sure. This is such a beautiful place. Sounds like you all are excited for your next adventure. We are only about 90 mins. from Chattanooga,Tn and 4 hours from Nashville. I know a real good realtor in the Murfreesboro,TN area. BLESSINGS with all you are doing! So lucky & smart to follow your dreams and heart. Not everyone can do what you are doing. We’ve lived in 7 different states and wouldn’t have traded it for anything. There are riches and lessons to be learned in every new corner of the world. New experiences keep everything fresh and exciting. Best of luck to you and keep us posted! Congratulations on your decisions; and you being able to start your new adventure while you are still able to move on to the next chapter –and enjoy the new beginnings while you still have the energy and resources to do so. I know nothing about your circumstances other than what I have read in your postings, which I have enjoyed thoroughly. If your move is to Tennessee; you will have better weather than in Ohio in the winter months; and will enjoy some southern living! I pray that you receive the money that you need for your farm; and that you are completely happy –and let God lead you as you make all of the changes. I am sure that y’all (There’s that southern thing…) have thought things through; so don’t let doubts creep in and question your decisions –even though things may prove to be upsetting at times (change is sometimes); you know that with God as your guide; happiness will describe your new life. God bless you; and I surely will keep you in my thoughts and prayers and excitedly look forward to how things progress for you as you settle into your next adventures. WOW indeed! I was born and raised in Ohio. Wonderful good memories of a childhood and young family life there. You will love Tennessee and the people there too. Ohio and Tennessee have basic value systems alike. My family now lives outside Nashville and enjoys it so much. At 75, I am retired in Florida. Happy will be the someone who buys your place. Quality throughout. Get top price for a one-of-a-kind investment. I will follow your adventures in the future, just as I have in the past. Thanks for teaching me so much already! Life is an adventure meant to be lived to its fullest. Your blog and books inspired me and helped our community group, Friends and Neighbors of Swannanoa, create a community giving garden here in our valley five yrs ago. We went through a lot of red tape, etc to get the use of the land (state owned )but finally have an all volunteer, nonprofit garden that helps feed the hungry in our valley. Thank you for your inspiration and the tips we often use, as well as share on our Facebook page. I’m sure there will be moments when you feel a twinge of “homesickness” for the farm but am sure your new adventure will overshadow that. Enjoy your new adventure and wherever life takes you. How exciting! I moved to Tennessee six years ago . The cost of living here is so low you can do just about anything you want! I live in the country, have 10 acres with a small doublewide and it’s only worth $50,000. Why not keep farm in the family and allow someone the opportunity to run the business? I have two A.A.S. degree’s one in Business Administration and one in Hospitality with a Culinary certificate. I’d love the opportunity to be educated in running a farm, for I love gardening but I’m a city raised person, now I’m 51 I would love to get into farming.